Good afternoon and happy Sunday. Here's my second piece for the Tip Your Hat event at Lost Coast Designs. So put your thinking caps on (sorry but I couldn't resist that one) and join in with our event over on the Portal. 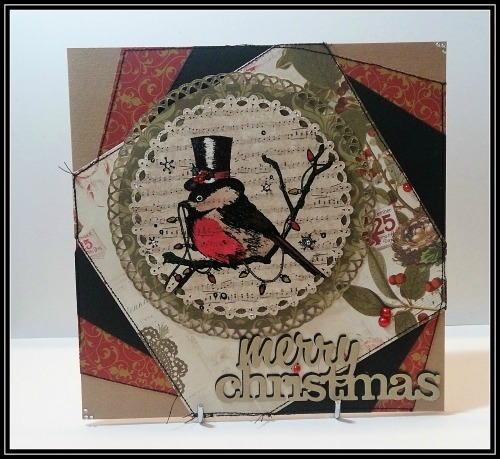 I'm also entering this into the Happy Little Stampers Christmas challenge. I love the stamp you've used as your focal point -that cute birdie looks so fun holding the lights! Beautiful colors and details. Thanks for joining us at HLS August Christmas challenge! A smashin' card Sue,love the cheeky chap! Love your beautiful card, Sue! The bird holding the Christmas lights is funny and pretty! Kisses, my friend. 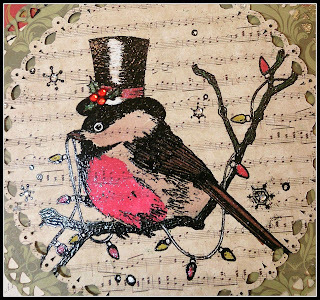 Gorgeous card, what a lovely bird, so sweet!! !